Daimler employees can help a good cause by donating the cents part of their monthly salaries. The company matches the amounts that are donated. In this way, the ProCent fund supports charitable projects in Germany and other countries all over the world. Most of the guests from abroad who visit the city of Arusha in northeastern Tanzania are coming in order to observe animals in the wild. For them, the city is a starting point for safaris in the national park of the same name. But when people from time2help come to Arusha, they stay in order to help local people, especially children. 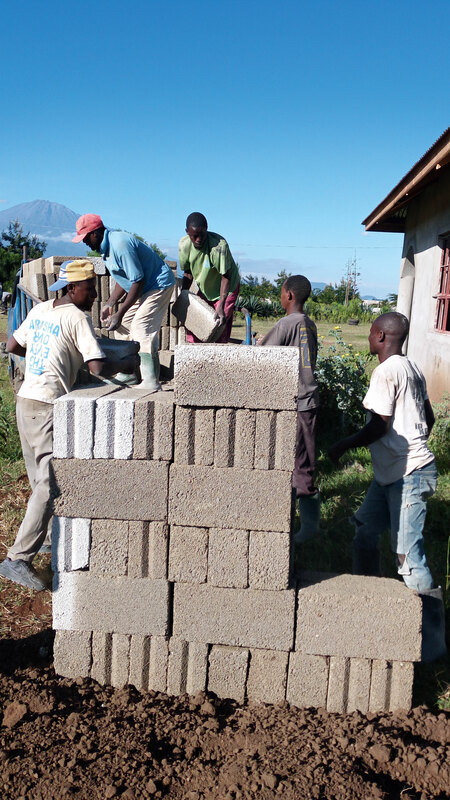 This association, which is based in Böblingen, Germany, supports the work of a local initiative that operates an orphanage and a boarding school in Ngulelo, six kilometers east of Arusha. The initiative’s work is funded solely by donations. More than 130 children have found a loving home at the Living Water Children’s Center (LWCC). Many of them are AIDS orphans; others were rejected by their families or ran away from home because there they had experienced more suffering than love. Since 2015, 14 children with albinism have also been living at the LWCC. They stand out because of their light-colored skin and hair. They have to avoid sunlight because their skin lacks protective pigments. But that’s not the only reason why they can’t move around freely. These children’s lives are constantly under threat, because many people in Tanzania and all of East Africa believe in the superstition that the body parts of albinos bring good luck. As a result, people with albinism are ruthlessly hunted and killed. The fact that the sale of such supposedly magical body parts lets the sellers earn good money makes it even more diffi cult to protect albinos. The government of Tanzania has declared it will deal severely with the perpetrators, but so far only a few of them have been tried and sentenced. The children who are at risk are brought to state-operated orphanages for protection, but in many cases they lead a miserable life there without proper care or assistance. The albino children came to Ngulelo from one of these badly overcrowded state-operated orphanages. “Even though security guards had been posted at LWCC around the clock, shortly after the children arrived a group of manhunters tried to attack the boarding school,” reports Esther Nestle, the director of the time2help association. It had quickly become obvious that the school needed more protection. It needed to have a high wall surrounding not only the Children’s Center but also the outdoor area around the primary school and the secondary school that is under construction. The problem was that the school did not have the _44,000 it required to build such a wall. “When you hear something like that, the only thing you can do is to help if you have the opportunity,” says 30-year-old Angelo Kreczmarsky, who works on the S-Class engine production line at the Daimler plant in Sindelfi ngen. His sister-in-law had worked as a teacher in Arusha during her semester break. When she told him about the school’s problems, he decided immediately to apply to ProCent for funds to fi nance the construction of the wall. Like many of his colleagues, Angelo Kreczmarsky has been contributing the cents part of his monthly salary for years to a charitable fund that was initiated by the General Works Council. About 100,000 Daimler employees participate in ProCent. Daimler matches the amounts that are donated. As a result, many small contributions eventually generate an astonishing total. ProCent has already donated approximately _4.6 million to charitable projects. The employees themselves decide who should receive the donations. They can apply to ProCent for a donation to an initiative in which they themselves are active volunteers, or they can recommend other projects that they believe are deserving of support. Angelo Kreczmarsky worked together with the time2help association to formulate arguments, list the costs of building the wall, and fi nally hand in his application to the ProCent coordinator in Sindelfi ngen. A selection committee consisting of equal numbers of General Works Council members, company managers, and members of the Group’s Management Representative Committee approved the application. A short time later, Angelo Kreczmarsky had the crucial letter in his hand: ProCent promised to provide the missing funds for building the protective wall. By now the wall has been fi nished, and since then there have been no attacks on the albino children. What’s more, the operation of the LWCC now rests on a more stable foundation. Thanks to the school’s excellent reputation, Many of them come from the local area, and their parents pay their school fees. When the secondary school is opened in 2017 according to plan, even more albino children can be accepted at the center to live and learn in Ngulelo without any fear of persecution. The protective wall for the children in Ngulelo is just one of 788 charitable projects that have received assistance from ProCent since it was launched in 2011. The projects include assistance for children and teenagers as well as people with disabilities, other kinds of charitable work, and initiatives for protecting nature and the environment. Most of the projects receiving assistance are in Germany, and the majority of them are located near a Daimler facility. They refl ect the Daimler employees’ strong and extremely varied range of commitments. For example, during his leisure time Thomas Pompe from Department 2 of the factory fi re brigade in Sindelfingen volunteers at the rescue dog unit of the Workers’ Samaritan Foundation (ASB) in Esslingen. The unit has 15 rescue dog teams, each one consisting of a handler and a dog. In seven of the teams, the dogs are still in the training phase. radius is international. It has already provided funds for projects on fi ve continents, including 52 in Africa. There are more than 30 ProCent projects in Asia. Matthias Heck is assisting one of them. He works in the Facility Management unit at the Daimler plant in Rastatt and has been a member of Bác Ái for many years. Bác Ái is an association based in Karlsruhe that supports impoverished rural communities in southern Vietnam. Its name, which means “brotherly love” in Vietnamese, sums up the work it does. 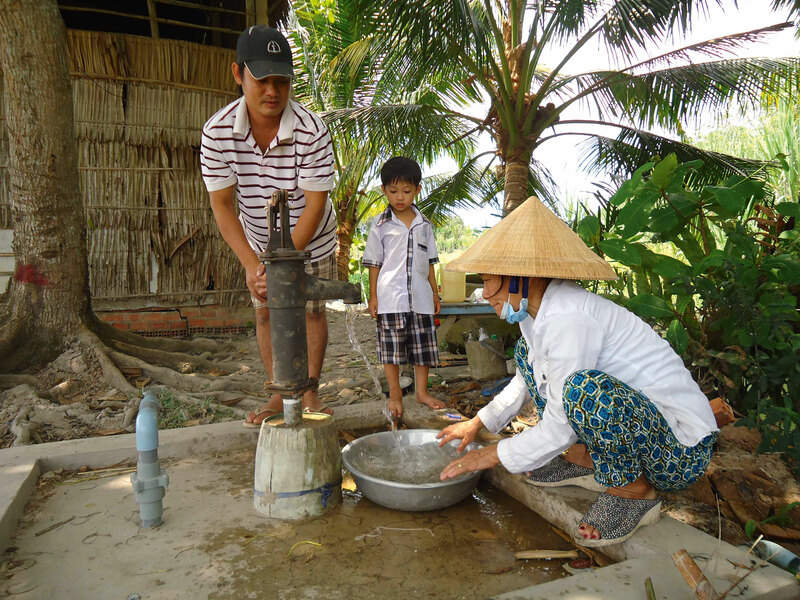 Bác Ái focuses on well-digging projects in remote areas of the Mekong Delta. In the past, the local people drew their drinking water from rivers that in many cases had been contaminated with fertilizer. Thanks to more than _13,000 in funding from ProCent, a total of 100 wells have been dug in the region since 2015. The main benefi ciaries of the new wells are the local children, who had previously often suffered from life-threatening diarrhea because of the contaminated water. In many projects like this one, the support from ProCent benefi ts children in particular. Many of the people who donate to the foundation are especially committed to enabling children to have a better future. One of these children is Pendo from Tanzania, a 12-year-old girl with albinism who has been able to start a new life in Ngulelo thanks to ProCent. She has a dream: She’d like to become a politician so that she herself can fi ght for a better life for albinos in her homeland. In order to do that, she wants to go to school. And thanks to the protective wall around her school, she will be able to do that safely.